There’s no doubt that artificial intelligence tools will revolutionize healthcare — it’s already doing so by helping human healthcare practitioners diagnose skin cancer more easily, discover new and unexpected drug interactions, as well as assisting scientists in untangling the complexities of the protein-folding problem. 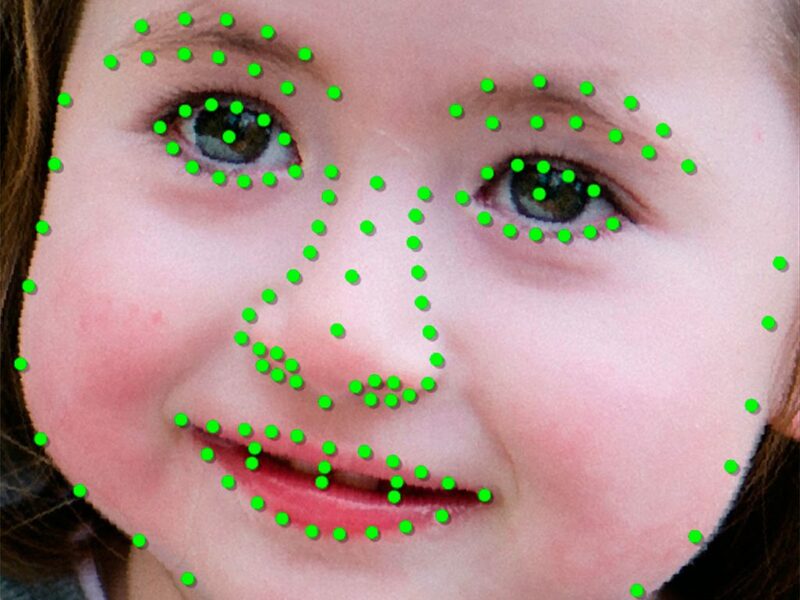 Now, a recent study completed by American company FDNA suggests that in the not-so-distant future, artificial intelligence may also help diagnose rare genetic disorders too, with the help of facial recognition algorithms. According to the team’s research paper that was recently published in the journal Nature Medicine, the team’s AI-assisted diagnostic tool could aid early detection of rare genetic disorders, and pave the way for a more personalized form of healthcare, or what’s known as precision medicine. Dubbed DeepGestalt, the technology uses a combination of computer vision and deep learning algorithms that have been trained with data from over 26,000 images of patients, presenting a range of over 200 genetic conditions. Much of this data was collected via their app, Face2Gene, which uses similar facial recognition and deep learning technologies to identify the tell-tale facial traits often associated with rare genetic syndromes. For instance, people with Cornelia de Lange syndrome will typically have long or thick eyebrows, a small nose, a thin upper lip and downturned mouth. Such traits can be picked out by a human specialist, but the problem is that people might finally see a genetic expert only years after the first symptoms appear, and even then, finding the correct diagnosis doesn’t come cheap nor quickly. On top of that is the possibility that individual human genetic experts might not necessarily have extensive experience with all the rare and obscure genetic conditions that are out there, and therefore give a wrong diagnosis. Thus, a facial analysis framework such as DeepGestalt would be an invaluable tool for clinicians in accurately detecting these disorders early on, as early diagnosis can help prevent developmental delays or potential health problems for patients later on. To boost diagnostic rates, DeepGestalt operates using deep convolutional neural networks (DCNNs), which help to address the discrepancies in face size, background, expression, and lighting in patients’ input photographs. The software first pre-processes an image with a landmarks detection algorithm that targets 130 facial landmarks. 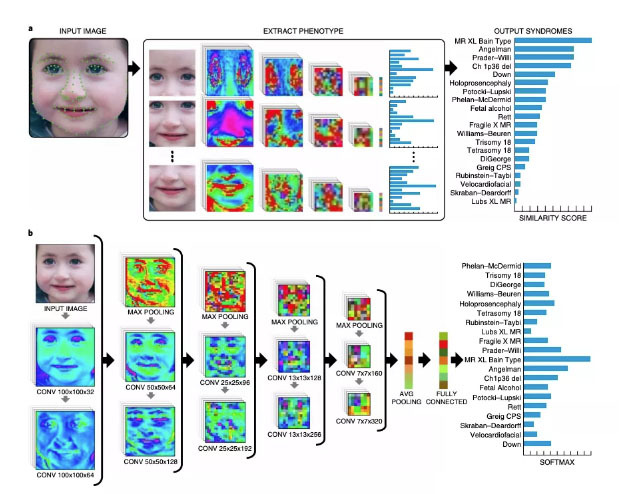 After pre-processing, the image is then cropped into “facial regions”, which are each fed into DCNNs to perform a genetic syndromes classification task, then aggregated and compared to the database to come up with a ranked list of genetic syndrome predictions. Not surprisingly, DeepGestalt did a much better job than its human counterparts in these classification tasks. During the team’s tests on 502 images showing patients with 92 different genetic disorders, the software was more than 90 percent accurate in determining the syndrome, compared to human clinicians who achieved a 70 percent accuracy rate. To see how the algorithm would perform in a situation with less training data available, the team ran separate tests tackling the more difficult-to-detect Noonan syndrome and found that it had a lower accuracy at 64 percent, which still outperforms human experts. The team is now working to combine the DeepGestalt framework with genome sequencing data, in order to enhance the accuracy of molecular diagnostics, thus expanding the field of personalized, precision medicine. Of course, for now, the idea here is not to replace humans in the process, but to integrate such a tool into diagnostic procedures to boost detection rates and improve overall outcomes. In addition, the software isn’t a replacement for an actual genetic test, which can offer more insight into the mutation of specific genes that underlie these syndromes. Nevertheless, adding tools such as this will no doubt offer a glimmer of hope to families in search of answers. To find out more, read the paper.